416 pages.Suggested retail price, $34.95. ISBN 1938099036. Where other chicken breeders failed, Professor James Dryden in Oregon succeeded, when “Lady MacDuff” laid 303 eggs in 365 days in 1912-1913. How did he do it? Through the methods described in this book, which can be divided into two parts: his successful breeding techniques and his simple yet effective management techniques. Dryden’s breeding techniques were so successful that he created not one, but three record-breaking strains of chicken at the same time. This book describes these efforts in detail. Dryden’s management techniques were equally successful and endeared him to farmers across the country. 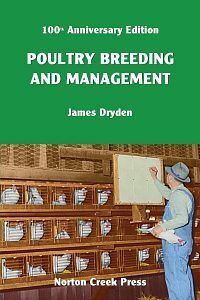 Poultry Breeding and Management, first published a century ago, was an immediate hit with farmers and breeders alike, and remained in print for nearly thirty years. It was the best, most popular, and most influential poultry book of its time, and remains well worth reading today. Origin and Description of Breeds. Kinds of House to Build. Diseases and Parasites of Fowls. 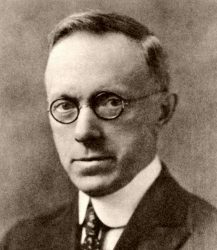 James Dryden (1863-1935) was Professor of Poultry Science at Oregon Agricultural College (now Oregon State University) and was the first to demonstrate that egg production can be increased through selective breeding. He is the only poultryman ever inducted into National Agricultural Hall of Fame.